The smell of butter, chocolate and spices used to always fill my house in the lead up to Christmas. Since I can remember mum has always baked shortbread to give away as gifts and to add to her infamous Christmas platter. Piled high with baby fruit mince pies, gingerbread, macarons, nougat, florentines, and her delicious shortbread stars, mums Christmas platter is a family highlight and a sweet-treat for the senses. Cooking and baking have always played a big part in the fun and excitement leading up to Christmas day. Do you have any family Christmas cooking traditions or a favourite shortbread recipe? Let me know in the comments below, I’d love to hear from you! PS: Make sure you check out my other shortbread recipes Spiced Chocolate and Vanilla & Rose from this Christmas baking series. Line two large baking trays with baking paper and set aside. 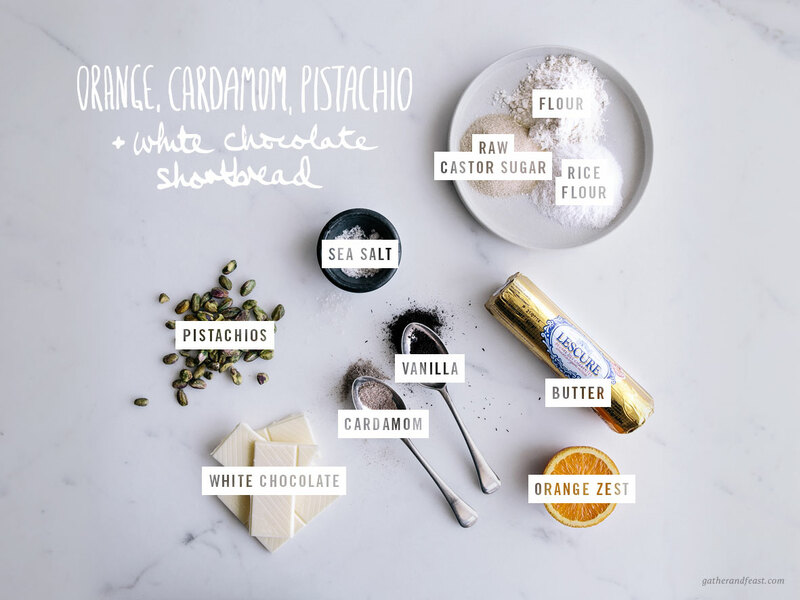 Add the flour, rice flour, vanilla, salt, orange zest, cardamom, pistachios and white chocolate to the creamed butter and sugar. Fold the ingredients together until just combined. If you are baking the shortbread straight away*, take the dough from the bowl and place onto a lightly floured surface. Using a rolling pin, roll the dough out until it’s about 1cm thick, then cut the dough into 6cm rounds using a cookie cutter. Place the shortbread rounds onto the pre-lined baking trays. Place into the oven and bake at 180 celsius for 10mins until pale golden. Remove the trays from the oven and leave the shortbreads to sit for about 5 minutes before placing on a wire rack to cool. Enjoy! * If you like, you can keep the dough in the fridge for a few days until you are ready to bake. Remember to allow the dough to come to room temperature before rolling and baking.